Your pedals are one of the most important parts of your bike. They’re the place where you get your power to the wheels. The more power you can deliver, the faster you’ll go for longer without wasting energy. If you’re looking to replace your pedals, you’ve probably reached the stage in your cycling where you’re looking for that extra edge. When replacing your pedals, it’s worth thinking about what you’re going to use your bike for. If you’re a regular cyclist, then it might be time to invest in clipless technology, but if you only go on short rides then a lightweight, flat pedal might be best. We’ve taken a look at a range of different pedals to introduce you to some of your best pedal options. There are a variety of road bike pedals below for all kinds of riders with all kinds of budgets. In terms of design, the BONMIXCs are classic flat pedals. They have a nice wide platform, meaning that you can easily grip on to them while riding along. They’re made from a high-grade aluminum alloy that has been given surface oxidation treatment, making them more resistant to scratches, abrasion, and corrosion. It’s fair to say they look pretty cool too. Undoubtedly the best feature of these pedals is the anti-skid nails. They are sizeable studs that are embedded on both sides of the pedal, meaning that your feet are much less likely to slip off, especially in rubber-soled shoes. 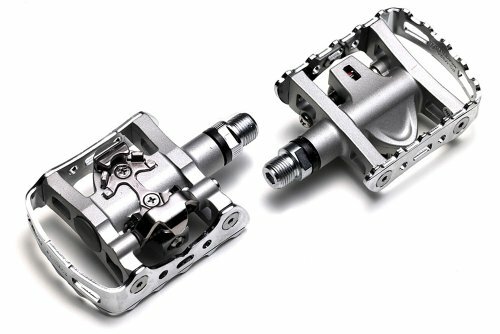 Why We Like It – These are excellent flat pedals to replace your stock pedals. They’re lightweight, good value and versatile. They’d be well suited for short rides in an urban environment. The SHIMANO SPD-PD M520 is the first of our clipless pedal options. The first thing to realize about ‘clipless’ pedals is that you do actually have to clip into them. This means that you’ll have to invest in a special pair of cycling shoes that you can fix the cleats into. If you’re starting to go for long rides where you’re not stopping very often, this might be a really worthwhile option. 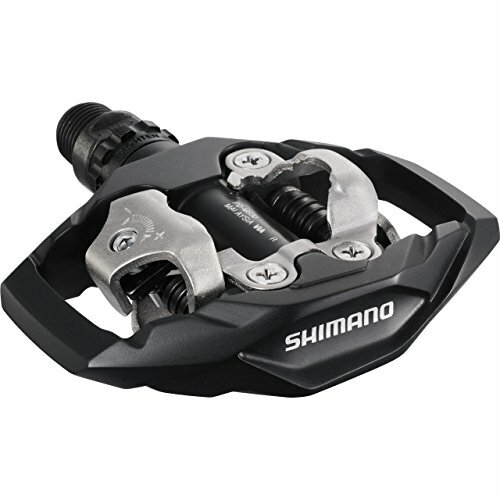 The Shimano M520 are great entry level clipless pedals. The unclipping tension is adjustable with the provided Allen key so that you can get used to attaching yourself to your bike. Why We Like It – Shimano has led the way in pedal technology, and these pedals are a great way to benefit from that at an affordable price. 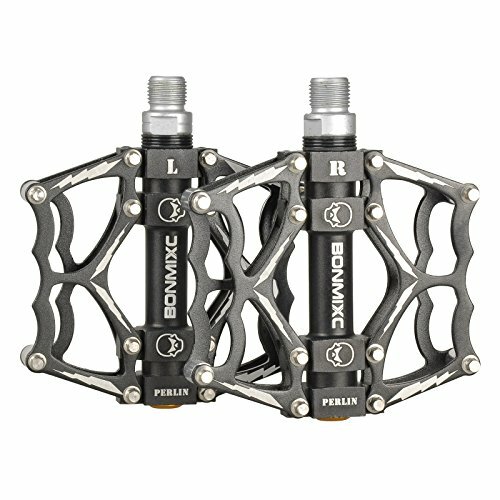 If you’re looking for a pair of entry-level clipless pedals, look no further. These are an exciting set of hybrid pedals. They look like an old-school caged platform pedal, and on one side that’s exactly what they are. Flip them over though, and you’ll find an SPD pedal fitting. If you have a bike that you take out for long rides on the weekends but also use it to run to the stops during the week, these might well be the pedals for you. They even come with a set of cleats. You can attach a Velcro strap or clips to the pedals if you want even more versatility. They’d also be great for touring in case your cleats became worn out. The dual nature of them does add a little bit of extra weight so if you’re a racer trying to trim those extra grams then maybe these aren’t for you. Why We Like It – It’s a pedal that can be all things to all people. We love the design and think that it gives you and your bike a fantastic level of freedom. With these pedals, you really do get the best of both worlds. This is another pair of hybrid Shimano pedals. They’re a little more expensive than the ones above, but they come in at a slightly lower weight, close to a standard pair of clipless pedals. They’ve got a slightly more modern design that looks a little bit more like a clipless pedal than a traditional one. They provide the same hybrid benefits as the PD-M324 and also come with a set of cleats so you can get riding straight away. They’re easy to install, and once they’re on your bike, you’ll be able to ride away in sneakers or cleated cycling shoes with ease. The platforms are a little slicker than those on the PD-M324: it might be better to consider these pedals as clipless with the option of using flats. Why We Like It – A more racing-orientated hybrid pedal. They come in at a surprisingly low weight while still being able to offer that useful dual functionality. These classic clip-pedals are the design that Shimano’s SPD technology attempted to replace. Sometimes though, the old ways are best. 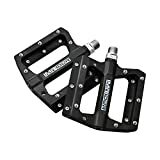 These pedals are excellent value, and once you’ve got your feet into the clips, they give you that extra boost on long rides. The high teeth on the pedals mean that they’ll grip your shoes to prevent slipping. The clips are pre-installed meaning that you won’t have to fiddle about before attaching them to your bike. An obvious advantage of clipped pedals is that you don’t need specialized cycling shoes so you can head out on your bike without needing a change of footwear. They come with built-in reflectors making them ideal for urban environments. They’re of a resin and alloy construction meaning that they’re built to last. Why We Like It – If you haven’t used clipped pedals before these will give you a really good sense of why they’re so useful, allowing you to utilize the power of the upstroke. They’re excellent value and an ideal entry-level product. These pedals have a clear freestyle BMX influence. They come in a variety of vibrant colors and will look striking on any bike. They’re made from a high-grade polyamide meaning that they’re lightweight while also being resistant to abrasion and corrosion. Because they’re plastic, they also won’t scratch your walls if your bike lives in your hallway. More than this, they’ve got great anti-skid nails across both sides of the pedal, ensuring that your feet won’t slip off. In fact, the nails are actually fairly sharp so do be careful if you’re using them for a commute and don’t have a developed riding technique. Why We Like It – These are great value pedals that will perform well in all weathers. The studs are really effective, and if you’d like to add a pop of color to your bike, then they allow you to do that. 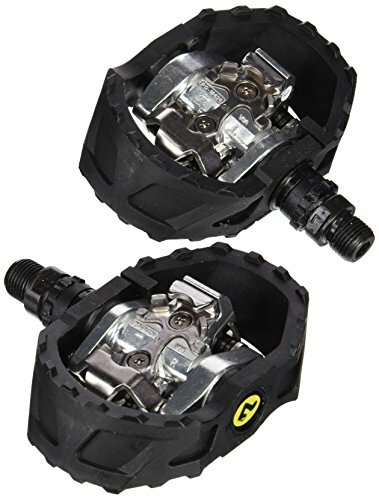 This is a pair of Shimano clipless pedals with a wide plastic cage. They have SPD technology on both sides, meaning that it’s much easier to clip in. In addition, they’re spring loaded so that they hang in the perfect position for you to clip in. The plastic cage gives two benefits. Firstly, it allows for more contact with the pedal, meaning that for urban or off-road rides you’ll have a lot more stability. Second, it gives the option for the pedals to be used without cleated shoes. Again, this makes the pedal a hybrid bike model, giving all of those versatile benefits. You can feel the fittings when you’re just wearing sneakers so if you don’t often wear cleats, maybe look at another option. Why We Like It – You could use this pedal in the city, on the mountainside, or on the track. It really is incredibly versatile. For the price, it has an amazing capacity. These pedals come in at a very impressive 196g. They’re made from a magnesium alloy which is lighter and stronger than aluminum, which is often used. They’re a flat pedal with anti-skid studs, saving your feet from slipping. The pedals come marked for easy installation. There are also fittings for attaching straps or clips if you want that option later on. In addition, there’s a nice wide platform with a concave design for comfort and pedaling efficiency on long rides. The studs are replaceable if any come out and the bearings are sealed so that the spinning functionality remains consistently smooth in any weather. Why We Like It – A stylish, lightweight, versatile pedal. Replacing your stock pedals with these will noticeably improve your performance without needing to adapt your riding style. These are a very striking looking pedal with an almost skeletal, monochrome design. They’re made from aluminum and are lightweight. Both sides have well-shaped anti-skid studs and are very easy to install. 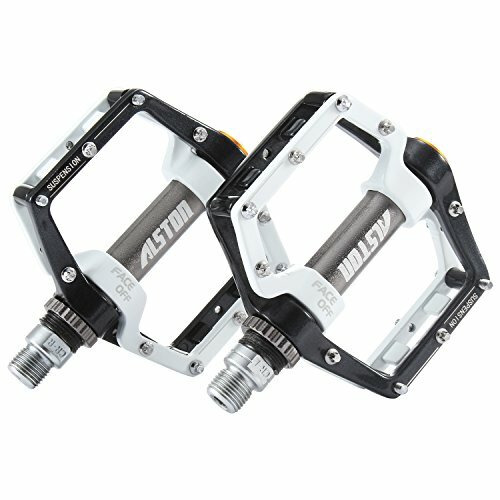 Alston is a reputable brand that has been in the business of producing bike pedals for fifty years. The pedals are suitable for any kind of bike but would suit a rider who has a particular eye for design and wants something that will stand out. If you’re doing a lot of off-road riding, then they don’t easily cake with mud and are exceptionally easy to clean thanks to the open design. There isn’t the option to install clips, though. + Good for light riding or commuting. 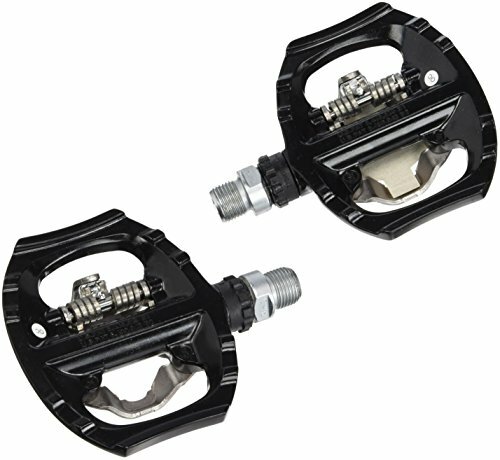 Why We Like It – These are an excellent-looking pair of flat pedals. They come with a good platform size which offers good stability and allows you to push ahead through long rides. 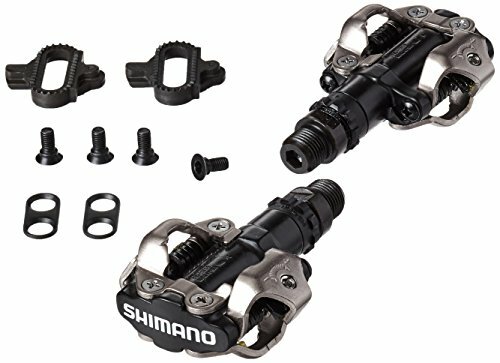 These pedals are fairly similar to the Shimano M520s, but they incorporate a wider metal cage which gives you increased stability. Because of the cage, they’re definitely a little bit heavier. The clips work on both sides, which means you won’t have to waste time trying to spin the medal round. There’s a chrome-moly spindle with a sealed bearing axle meaning that the pedals will be low maintenance and perform well in all weather conditions. The integrated pedal cage means that, at a pinch, these pedals could be used without cleated shoes, but you wouldn’t want to cycle very far without cleats. The platforms give you that extra bit of versatility in urban or off-road situations. Why We Like It – These are almost hybrids of hybrids. They give you that extra stability that you can sometimes lack with smaller clipless options. They’re a really good choice for your first pair of clipless pedals. So you’ve decided you need a new pair of pedals. There’s a lot of options out there, so you need to ask yourself what it is you mainly use your bike for. Now, the answer might be lots of things! And that is definitely something worth bearing in mind. There are plenty of pedals that cater to one specific type of cycling and plenty that are much more versatile. In addition, there are many other considerations like the style, design, and weight that mean that the options are fairly limitless. We’ve drawn up some of the key considerations below to help you make your mind up as to what kind of pedals you should be buying. For some cyclists, weight is absolutely everything. For them, it is about shaving off every single last gram so that they can achieve the fastest time around a course. Conversely, for a lot of cyclists, a few ounces here or there won’t really make a huge difference. Cutting down on your weight can be a really expensive endeavor, but there are some options on the list that mean you can have lightweight pedals without breaking the bank. The big consideration when it comes to weight is nearly always material. Most of the options in the list are made from aluminum alloy which is a common material on bike components because it is lightweight but also strong. 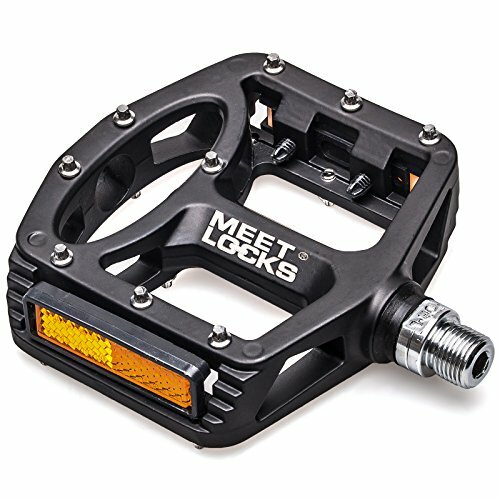 The MEETLOCKS pedals are made from magnesium alloy which is even lighter, shaving off a few extra grams. Similarly, the Imrider pedals are made from a polyamide which is a slightly unusual material but ideal for pedals. On the whole, flat pedals tend to be a bit lighter because they have less going on. If you need clipless pedals that aren’t at all heavy, you need to look at the skinniest ones: the M520s. It would be silly to pretend that the aesthetic design of your bike isn’t important. Bikes can be real fashion statements and changing the pedals are a really quick and easy way to improve looks and performance at the same time. Flat pedals tend to offer more customization with plenty of different color options. They can range from a really classic look to something incredibly vibrant. It’s worth having a browse of the products to consider your color options and think what might complement the color of your existing frame. There’s no point getting something that is going to look terrible. A lot of the hybrid clip pedals also have some really appealing and sleek designs that can enhance the appearance of your bike while giving you that extra capability. Now, this is the really big question when buying your pedals: what level of technology are you planning on getting. Flat pedals are the most common type of pedal. They provide a flat surface that you push down with on your foot, powering the bike. They’re really versatile and usually the best value. In addition, they’re lightweight, and when they have anti-slip studs, they provide excellent grip. Stock pedals tend to always be flat but upgrading to a lighter pedal with studs can really enhance your riding experience. Clip pedals are the next stage up from flat pedals. They include a fabric or wire cage around a flat pedal that you put your feet into and ‘clip’ yourself in. The whole idea behind them is that you don’t only have force when pushing your foot down into the pedal, but you can also exert force by pulling up. They maximize cycling efficiency by doing this. It is worth noting that it can be tricky to get your feet into the clips and you should definitely practice using them before heading out onto the open road. If you’re commuting and stopping and starting regularly, often clips might be more of a nuisance than they’re worth. They really come into their own, however, on long cycles. Clips can often be added to certain kinds of flat pedals, but this is quite fiddly to do. Clipless pedals take the same principle behind clip pedals but use cleats instead of the cages. This means you need specialized cycling shoes which have a fitting on them which then attaches to your pedal. It makes for an even more efficient cycling experience as instead of having to pull up with the top of your foot, the fitting on your shoe means that you’re securely attached, making it less of an effort and more automatic. Like clips, they take a little bit of getting used to, and you should definitely practice with them because they can be difficult to disengage from. Usually, however, they have adjustable tension settings which can be changed as you get more confident. They are often quite lightweight as the fitting itself is a lot small than a regular flat pedal. The obvious disadvantage is that you need to always be wearing your cleated cycling shoes. Hybrid pedals are clipless pedals that have a platform built-in so that they can be used without cleated road cycling shoes. They’re sometimes a little bit heavier, but they provide an excellent balance between efficiency and versatility. It basically means that you can use your bike for both long rides where you want to maximize your distance and shorter runs to the grocery store. Hybrid pedals can vary in their level of hybridity: some truly do function just as well without cleated shoes, but some just have a slightly larger platform and would be uncomfortable to use without shoes over a long distance. Hybrid pedals work especially well more for the commuter and off-road cyclists because you can still push on the pedal even when the cleat isn’t attached. This is useful if you’re stopping at lights frequently and need to get moving with the traffic. If you’ve got a damaged pedal and you’re looking to make a quick substitution, then your best option could be a pair of flat pedals. They come in a variety of options, and you’ll generally be surprised at their value. However, if you’re getting more serious with your cycling and regularly do rides of five miles or more, you’d probably benefit from clips or clipless pedals. They really do allow you to go much further for the same level of effort. Clipless pedals are more of an investment (especially as you have to purchase the shoes), but if you’re getting serious about your cycling, they’re definitely something you should consider. A good option might be a hybrid pedal with a reasonably large platform, especially if you haven’t used clipless pedals before. The pedals on your bike are pretty important, though – as this study explains further.